So what’s new this week. Ruby is now 6 months old and full of energy. She doesn’t want to be left out of anything. She now likes to put her front feet on the work top just to see what I am doing. Oh and she managed to help herself to a skate wing I was about to cook. Now you see it and now you don’t. So I have to keep my wits about me. 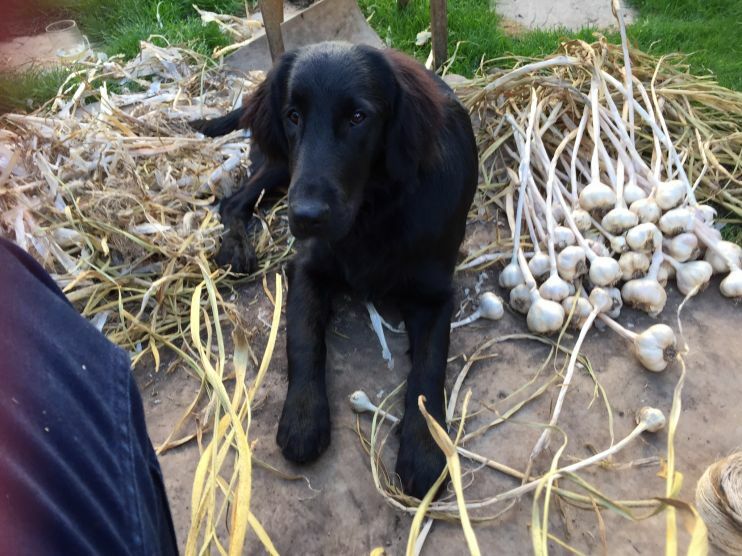 This is Ruby helping us plait the garlic as usual her nose and paws are in everything. Training is going really well she just seems to take on board whatever I’m trying to teach her. Which recently is not jumping on the bed til at least 6am!!! But she is such an affectionate dog and just loves a cuddle. Generally Training is good. Stays are going well especially for a dog who struggles to keep her feet on the floor most of the time and the Fun Flyball box is proving great a hit!!! More on that next time.